Normally, there’s a distinct drawback to a food truck. Where do you eat the damn stuff? The possibilities include a curb, a shared picnic table, the unprotected front seat of a car, a dusty parking lot. None are entirely satisfying, the hope being the food is sufficiently transcendent to transport you to another world. 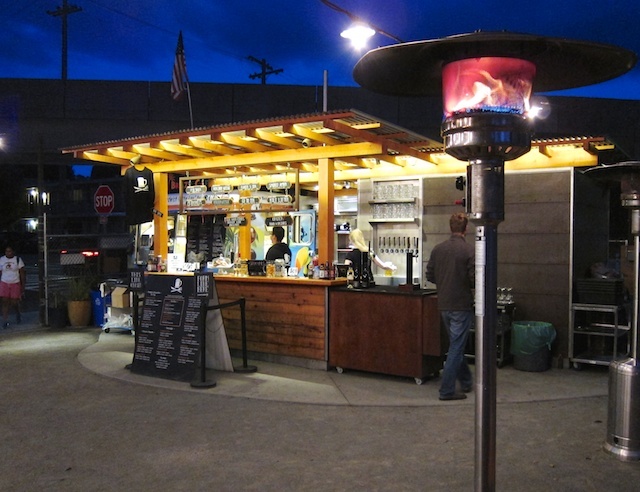 Fortunately, Brazil Cafe has come up with a lovely solution at one of its Berkeley, California locations. Technically, it’s not a truck, more of a hybrid, with a beautiful fixed kitchen where the food is prepared and where partner Westbrae Biergarten pours glasses of local craft beer. And yes, the seating is still mostly upscale picnic tables, with a few lawn-furniture tables and umbrellas added in what appears to be an old parking lot. But everything’s nicely spaced out, creating a most inviting aesthetic. 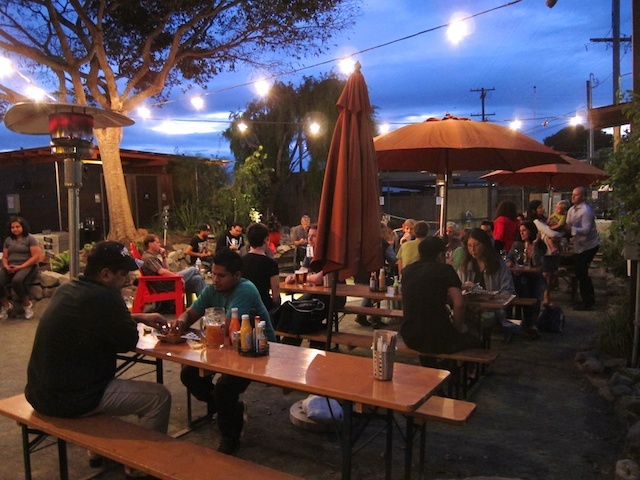 It’s a wonderful place to linger over food and a beer or glass of wine on a warm Berkeley evening. The cardboard boxes of food are mostly $9 or $10 and quite tasty, with the rice bowls and sausage winning out over the tri-tip sandwich, the latter’s indifferent bread knocking the grade down a notch. This entry was posted in American restaurants, Berkeley, California, Food truck, road food, Road trip food and tagged Berkeley Restaurants on March 6, 2015 by bcorbett907.